Debut single of the newest South Korean band B1A4 called "O.K. "(sometimes OK Go). This song is from their debut album titled "Let's Fly" which is available for purchase digitally. 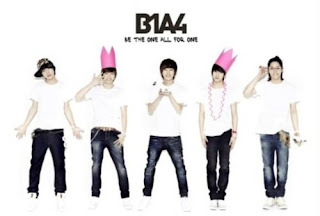 The members include Jin Young, Baro, Gong Chan, Sandeul, and CNU. These young men average age is about 17. These OK Lyrics will be updated without any notifications. OK video recorded by B1A4 is located above. As you notice, we don't have the full precise B1A4 - OK Lyrics. But if you happen to have some parts or maybe the full lyrics, please put it on the comment below or submit the lyrics directly. You can also suggest songs that are not in this blog yet. Oh, and can you please put some space between every verse so that it would not be so confusing. And put there if it's the chorus, bridge, refrain, etc. etc. Since B1A4 is a new group, can you please label which part the singer sang. That's right should be Let's fly. It's really an onomatopoeia for That's Right, right? finally, i found it..hihhihi.... gomawo..
Best viewed on 1280x768 or higher resolution.